Purchase more than 1 and save 50% off the shipping of each additional Versa-Tube! Perform strength and fitness exercises with resistance through a full range of motion during your personal workouts. This product comes in multiple resistance levels to accommodate all fitness needs (see our other versa tube listings). Padded handles. Instructions included. Length: 48" Wt. 1 lb. Padded handles fit more comfortably in hands. Youth and those with little or no exercise activity. Advanced beginners and those who regularly exercise. Starting size for most men. 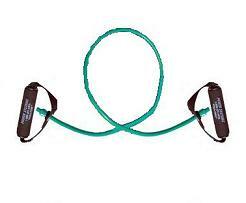 More advanced exercisers, good for training large muscle groups. Highly trained with correct form and technique. *Resistance levels are measured at 100% elongation, twice the unstretched length and should not be stretched beyond this point. Competitive Edge Products, Inc. is an authorized reseller of Power Systems Fitness Equipment Light Green VersaTube Resistance Training for your personal workouts. Fast shipping, item exactly as described, thank you. Exactly what I wanted. will buy again! Very happy, fantastic buy! Very nice so far. I like the sturdy quality. Q: looking for cost on 25 of these? A: They are $7.34 each. Feel free to contact us with any other questions. Q: what would be the cost of 25 of these? A: The regular price would be 183.50. In order to get volume discounts please call 1-866-308-5484 and request it. Fast Shipping: Orders for the Power Systems VersaTubeLightGreen generally leave the warehouse within 1-2 business days.